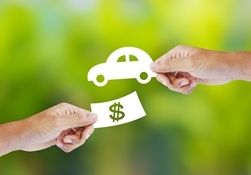 Overestimating Value of a Trade-in May Be Dealer Fraud | The Consumer Law Group, P.C. Unscrupulous car dealers commit fraud in many ways. The Federal Trade Commission has recently made efforts to crack down on these crimes, but they can’t be everywhere. That is why it is up to you as a new car buyer to be aware of the various ways dealerships take advantage of unsuspecting customers. They may use bait-and-switch tactics to get you to buy a more expensive car than you wanted or they may sneak dealer add-ons into your purchase price. Another way dealers commit fraud is by manipulating the value of your used-car trade-in to make you think you’re getting a better deal than you are, or misrepresenting the condition of the car. Even "new" cars can have prior damage the dealer does not want you to know about. Always ask if the vehicle was previously been damaged and have someone else with you to verify the sales person's answer. Shady car dealers know that you are hoping to get a big chunk taken off the price of a new car by trading in your current car. They use this to their advantage to draw you in and get you to sign on the dotted line. Some dealerships advertise a minimum value for all trade-ins. For example, they might advertise that they give $4000 on all trade-ins, no matter what the actual value is. Others may offer you more than the Kelly Blue Book value and convince you they’re just being generous. In both of these examples, it is likely that the dealer is planning to add the difference between the actual value of your trade-in and what he has promised you to the purchase price of your new car! In other words, if your used car has a Blue Book value of $2000 and he offers you $3500, check your contract for an additional $1500 added to the price of the new car. Before you take a trade-in to a dealer, look up the value and do not expect an offer higher than that. If you get a better offer, it’s probably a scam. Better yet, you can usually get the best value for your used car by selling it in a separate deal altogether and taking that cash to put towards your new car. If you find that you are the victim of any form of dealer fraud, you may feel embarrassed that you were so easily taken in. The thing to remember is that shady dealers have a lot of experience in pulling these scams and they are very slick about it. There is no need to feel embarrassed, but there is a need to fight back; and remember if it is a good case of fraud your legal fees often have to be paid by the dealer. Fill out the “Do You Have a Claim?” form on this page and we will get back to you with more information.